I know this is a busy time of year so right to it! 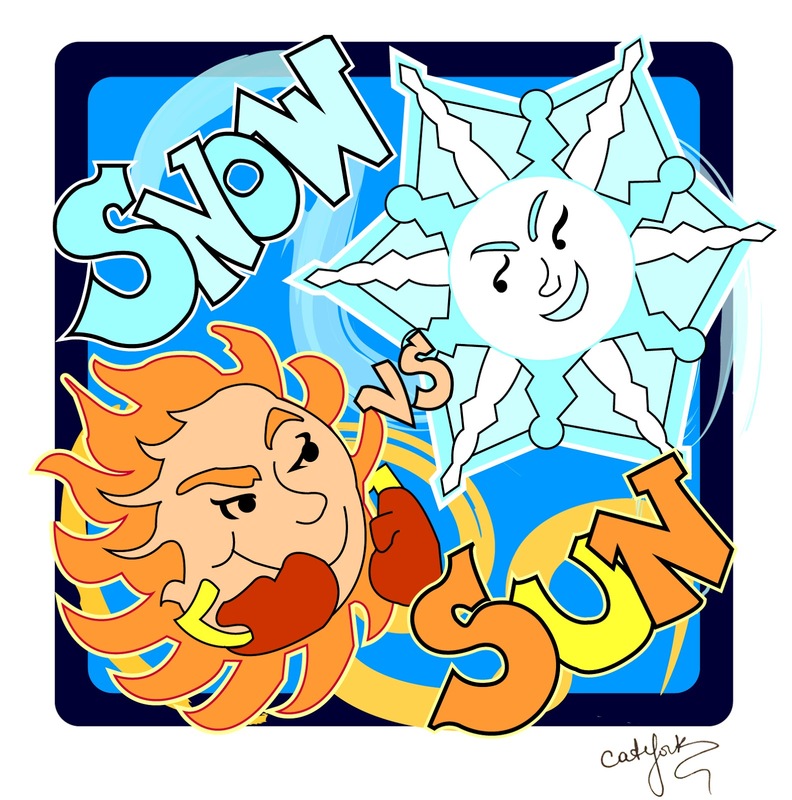 Sun versus Snow is coming! As of right now we have sixteen agents. (Agents announced in January.) You can see the rules here. My last couple of contests averaged three success stories from my picks alone. My free pass winner from Query Kombat in June became the runner up and got an agent! I know of one person from Sun versus Snow 2015 who not only got an agent but also a nice book deal! This is an opportunity you don't want to miss. A free pass allows you to skip the slush and become an instant pick. You will get to work with a mentor to improve your query and first page. Your entry will be seen by our agents and any ninja agents. And you'll be the first member of Team Snow! You must do two things to enter: leave a blog comment on this post and use the rafflecopter to record that you commented. If you aren't in the rafflecopter, it can't pick you as the winner. This insures the winner is random and no bias slips in. In the blog comment I want a short paragraph on what your main character would do with a snowball. Your main character suddenly has a snowball what does he/she do with it. Be creative but clean. It should be fun and imaginative. There's no need to post something long. Try and stay under 200 words. Use the rafflecopter for addition entries and to help spread the word. Please tweet about this mini contest and pass it along to your friends! The more the merrier! Amy and I agreed I can have TWO free passes! But the right conditions must be met. I picked December 22nd for my free pass to open for a reason. The paperback of Grudging comes out today and I wanted to celebrate! 1. Grudging hits the top 100 on Amazon in the paid Kindle Store category. 2. Or Grudging hits the top 10 in the other Amazon categories of historical fantasy, epic fantasy, or fantasy. 3. Or Grudging reaches 20 honest reviews on Goodreads or Amazon. For one or two, someone must send me a screen shot as proof it happened. To give everyone plenty of time to write their paragraph, the mini contest will stay open until January 11th. Good luck and I hope to see you on Team Snow! Ronan would utilize the sorcerers in her company, growing the snowball to a monstrous size before having an air worker launch it into the atmosphere over the Inner Sanctum, above the magical barrier ward. The fire worker would melt it to create a deluge, flooding out the tyrannical Magistratum and causing chaos as Ronan's rebel army laid siege to the capital city Vydarion. Rowan stared at the snowball in his hands. He had never seen one before, not one so perfectly designed as a ballistic sphere anyway. It was cold, but not wet, a little heavy, but it held together well. He knew what he needed to do. He crept down slowly down the hallway, looking for his target. She would probably kill him afterwards, something diabolical only Raptor could dream up. It would be worth it, totally worth it. He came around a corner and spotted her, standing with her back to him, working on something he could not see. He went closer. She suddenly stiffened and turned around. She had made him! He chunked the ball of ice and snow in Raptor's direction and ran. He never bothered to look if it hit or not, but the yelp of surprise and then the growl of anger told him he had hit his target. "ROWAN! You are dead! DEAD!" He yelled back, "Ten points for me! I'm in the lead!" WHACK! A snowball hit him on the side of the head and smeared cold all over the side of his face. He heard Tech chuckle, "Not anymore. I'm winning now." The snow had been falling for close to six months and showed no signs of disappearing. It was June, the longest day of the year, and summer was now only a myth. Roger stood at the edge of the embankment and looked down at what used to be the highway. The rusted skeletons of numerous vehicles jutted from the drifts, acting as snowbreaks against the howling storm. Roger bent and rolled a pile of the powdery crust in his hand. The flakes melted and merged until a ball of compressed ice was left behind. He remembered the New England winters of his childhood and his chest swelled with nostalgia. He launched the snowball into the blowing flakes and it ricocheted off of what remained of a car’s mirror. Sighing, he pulled his hood further over his face and disappeared into the wind. take a scraping of the stuff and press it together with your hands. curl your fingers around it so no point on the surface is further from its center than any other point, compress it carefully and you can make a missile that will be remembered by who you aimed it at, or. or you can present it with a flourish to your sister. She can whistle up a wind and hit a goose with it, a goose who will spread clipped wings and look around for an offender, blaming the nearest one - that boy there, the one who called you a Savant and useless and stole your hat. Now that boy runs howling from the most ill tempered breed of bird resident in the city, and he never knew yours was the hand that shaped it. And it feels good, until you remember that every word he said was true. Anna held the snowball in one hand, hesitantly tracing the fingers of her other hand across the crystalline surface. The ball of ice was the least of the gifts Luke gave her, but a thing of incredible beauty. Luke had scraped the last of the frost from the inside of the burlap-sack covered icebox to form the ball, and now the wooden chest stood empty, quickly drying in the searing heat. His arms slid around Anna’s waist, and she offered a silent prayer of thanks; she hadn’t worn her heavy corset. “Break it open.” Luke’s mouth warm against her ear, still Anna hesitated. The snowball was too beautiful to destroy—but the harsh Australian sun would soon turn the ice to tears. Carefully inserting her thumbs into the ball, she split the sphere into two almost-perfect halves, revealing the centre. Pressed into a snowy embrace lay a tiny violet, five miniature petals the exact shade of Luke’s eyes. Owen hates snow and all things related to winter. The only place he feels at home is outside in the forest, which is pretty much dead in the winter. What he'd probably do with a snowball is stab it with his sword. It wouldn't accomplish anything, but it sure would make him feel better. I'm a bit scared to see what he'd do to a snowman. Adria would probably eat the snowball. Not that it would be a snowball for long. When her mission to save her best friend from a cursed prince's army of the undead lands her in the middle of a torrid desert, surrounded by ruthless nomad warriors, water is scarce. A snowball would be a divine treat. Daisy would obsess over it, because she's OCD GIRL. She'd count the number of flakes in the ball, wonder if will melt before she can finish counting, may even get in the refrigerator with the snowball so she can finish obsessing over it. Ivy stared at the snow covering the grounds of Hollywood Arts Academy in disbelief. She hadn't seen the white stuff since she moved to Southern California from Maine. Apparently freaky weather wasn't just a New England thing. The other kids were going nuts over the snow, although most of them probably had seen plenty on their ski trips to Aspen or the Swiss Alps. One girl squealed when her boyfriend picked up a handful and stuffed it down her back. That gave Ivy an idea. Crouching, she gathered some snow with both hands and packed it into a ball. Tarquin, her crush, was picking his way along the path, his nose wrinkled in disgust. "I thought someone was filming out here," he said, "but this is real." "That's right, Tarquin. It is real!" Ivy's voice caught his attention and when he turned to look, WHAM, she sent the snowball right into his broad chest, where it blew apart. Tarquin's dark eyes were comically wide as he stared down at the white stain on his sweater. Then he bent down and quickly made a ball. The game was on. Movie star's son versus newbie filmmaker. The fresh blanket of snow brought the same joy to Willow that it had when she was a girl. She stomped through its powdery coldness, giggling when it landed on her nose. Hook leaned against the trunk of a tree, pointedly staring at his fingernails, rolling his eyes anytime Willow attempted to get him to join her. "How can you not like snow?" She asked, panting and breathless with excitement. "It's cold. It's wet. It's really cold." Hook said, counting each reason on his fingers. "But it's beautiful," Willow said, raising her hands above her head and spinning as new flakes dusted her hair. Hook would never admit it, but he could watch Willow play in the snow for hours. Her cheeks were flushed and she was enjoying herself so much that her face seemed to glow with joy. He was so busy pretending to ignore her that he didn't notice the snowball until it was too late. He caught it with his face. He wiped the slush away with his hand, glaring at Willow, who burst into giggles in the face of his anger. "This means war," he growled, scooping up a handful of snow and launching it at her smiling face. She ducked and ran to seek cover. He should have known she would drag him into her fun and games. He could never resist her for long. It hardly snows in Northern Virginia, but today of all days -- six inches on the ground! The entire DC metro is speeding and swooping all over Route 7 like roller derby queens. Barrie maneuvered through the mess to attend a big pitch meeting at work. Uncharacteristically, she'd gussied up with new leather boots. First day out and already I'm going to destroy them, she thought. Others' shoes had created a trodden trail to the door. Smoothing her wool coat, she carefully took her first steps into the worn path. I got this. Pow! A snowball smacked her shoulder, exploding down the side of her coat. Others followed, hitting her legs and boots. Bam! Another hit the back of her head. “NOT THE HAIR!” she howled. Behind the dumpster, two tech boys continued their assault. She half-heartedly aimed a snowball at them, then pranced along the path and flew into the building. She raced to the little fridge where the tech boys kept their Friday night beer stash. Lowering the temperature to 32F, her heart sizzled. You ruin my new boots and think it's funny. You like cold things? Let's see how cold you like your beer. Being from Australia, Sara would probably study it. She'd feel how the cold tingled her fingers, and how the snow mushed together to form the round fun-weapon she'd seen in so many Christmas movies. She'd think about how she felt cheated on that trip to England to visit her cousins - White Christmas, they’d said, wake up to a Winter Wonderland like you've always dreamed of. It was less White Christmas, more of a wet one. She'd juggle it gently between her hands, feeling frostbite settle in but she wouldn't care. Most importantly this snowball would remind her of outside. Nature. Elements. Freedom to roam. Not tin cans and time-sickness, recirculated air and two more years of purgatory disguised as conscription. And just when she'd realise she’d been lost within herself - she'd get interrupted by a familiar voice down the hall. An annoying voice, one which plagued her every day. Mischief would bubble within, the tiny devil on her shoulder not even having to whisper his suggestion. Eyes twinkling, she’d line up, pull back and let the snowball fly its course straight into the side of Aneurin’s face. She wouldn’t stop grinning for days. Celina smoothed her hand over the surface of the snowball she held, squinting ahead. She concentrated on her demon, Kai―the shadows slithering from him extinguished the light from the millions of tiny stars sparkling against the snow. How pissed would he get if I threw it at him? “You can certainly try, dove.” The smirk on his face dared her to throw it. She raised the snowball, and without ever losing her smile, threw it as hard as she could. Her eyes widened as it froze mid-air, hovering a few seconds before it burst into snowflakes, chilling her as they fell on her head. She backed away as she swept them from her hair, and yelped when she hit something solid. I pressed my hand against the glacial surface of the snowball, its touch soothing, yet deliciously warm. A flame of snow flaring up in my own hand. There was more fire than ice hidden in this frozen forest. Staring at the melting snowball, I remembered a time in my life when I didn't have to be a Queen, when I wasn't expected to be strong. Another time, on a different planet, when I was a Physicist. I whisked the thought off my mind before it could cloud my thoughts. Or worse, before it could hurt me. I would not waste my tears, I didn't want them. What I wanted now was ice. I wanted cold and a frozen heart. Ripping a stream of water off the floor, I commanded it to come to me as I added it to the glittering snowball. I smirked at the sudden idea that the snow seemed to be crying; the whole world seemed to be crying because of me. Sixteen-year-old Leila McQueen would hold her breath and stare at the snowball – for the longest time. Snow. The stuff of stories. Something that fell from the sky. A thousand feet beneath the surface of the ocean, she’s never seen the snow – or the sky. That was the old world, a whole different world, inhabitable for the past sixty-five years now since the waters rose. Human beings can no longer survive up there. Leila would cup the snowball in the palms of her hand. And she would call it magic. Outrageous magic. She would catch its glow from any and every angle possible. Maybe she could take a pic of it, share it with her dad once she found him? What would he say if he could see her now? He would laugh and say, “It’s fanbloodytastic, that’s what it is, Pickle.” Snow. Leila would close her eyes so she could really feel it. Cold, wet, tickling, enchanting. She would open them to ensure she caught every glare, each twinkle and luminous glint bouncing off the brilliant whiteness before it melted. Imagine. A snowball. Right here in the palm of her very own hand. Pure bloody magic. “Do you know how long it’s been since I’ve seen snow?” Fin closed his eyes and tilted his head skyward, the flakes dissolving into bursts of cool on his weary face. There was no response, but Fin didn’t expect one. Without looking, Fin knew that Benoic was watching him, hands resting on the pommel of his sword, allowing for this moment of respite from combat training. Indulgent and yet impatient. The first snowball missed. The second didn’t. Benoic ap-Ban, the most famous Knight of the Round Table, Champion of Arthur, Lover of the Queen, Destroyer of Camelot, had just been hit in the face. “Ha!” Fin laughed out loud. It felt better than he thought it would. To his surprise, the normally stoic visage of Benoic cracked into a knowing smile. Fin’s grin broadened. “You’ve had snowball fights?” It was hard to believe that snowball fights meant the same thing in Camelot as they did in Fin’s world, but, he reasoned, why wouldn’t they? He bent down to scoop up another handful of snow, delighted that, at last, he had made some sort of connection with his father. Can't find the Rafflecoptor. Please help. It's in the post just above the comments. Snow! Here? In December? I wouldn’t have believed it if I hadn’t been staring out the window instead of paying attention to my language arts teacher. But there it was. Snow. There wasn’t much, definitely not snowman worthy, but enough for one perfectly round, tightly packed snowball. Like Dad taught me. When we used to do that kind of thing. I shook my head. I had to focus on now and this snowball. So here’s the question: what should I do with it? Most twelve-year-old boys would just throw it, but that wasn’t an option for me. How about a snowball launcher, complete with a scope and heat seeker, to target my hormone-raging, noxious gas-emitting older brother? My brain tingled. An idea formed. After school I ran home, dug in my repurposed toy box, and pulled out an old robot designed to do my chores and the vegetable taste enhancer that turned my skin green. I connected the robot’s vacuum tube with the taste enhancer’s emitter, added a cooler, and finally, an imager. Then I put on my jacket and gloves, picked up the Riley P. Cooper Automatic Snowball Duplicator, and went to find my friends. Raised in Las Vegas, Raven’s never seen or held snow in her life. If she found a snowball on the Las Vegas strip, she’d probably auction it off to the highest, drunk bidder she could find. All the more funding to supplement her income from hustling pool and cocktail waitressing. Now once she got to Maine, land of snow piles, plows, and drifts, she’d most likely get into a ton of shenanigans. Can anyone say massive snowball fights, Berserkers versus Tricksters? Cleona would entrench her fingers in the snowball, familiarizing herself with the cold. Communing with the spirits means inviting death into her bones, and as an Arizona native who never sees a lick of snow, this would be the perfect opportunity to steel herself against the frigid feeling. She’d probably have a fleeting moment of sadness when the snow turns to water. She would have loved to do something more playful than simply hold the thing. It was only weeks ago that she was carefree—well, carefree in the sense that her sparse, ghostly communions didn’t involve her trying to dethrone the queen of the banshees. Now they’re all too regular and all too dangerous—she needs the cold. She needs to learn in order to save those around her. Thirteen-year-old Tim would find some way to hit his older brother's oafish best friend Rudy (picture Jabba the Hutt in a letter jacket) in the face with it. Rudy won't like this, of course, so he will retaliate by trying to kill Tim. Tim's older brother Kal will ultimately have to step in to save Tim's hide. Snow isn't dangerous, until it melts... Helena only just became aware of the Master of Water, Nile, and knows he wouldn't hesitate to use even the small amount contained in a snowball to torture her or someone she loves. If given a ghastly, traitorous ball of frozen water, Helena would have to dispose of it with haste, before it could become a weapon against her. Annie would throw her snowball at John, her mom's new fiance. But she would wait until he wasn't looking because she wouldn't want to get in trouble. And really, he isn't a bad guy, he just isn't Dad. If she aims just right, she might injure him just enough that he has to postpone the wedding. Then Annie would have more time to get her real dad and mom back together, and her family, and life, could finally go back to normal. If Mattie came across a snowball, it would most certainly meet its end either in, on or under Princess Athlendora. - If the Princess happened to wake up that particular day with the mind and memories of a toddler, she would loudly insist on Mattie giving it to her, and it would soon end up where most everything that version of the princess gets her hands on does: in her mouth. - If the Princess arose that day still in the body of a 6-year old, but closer in mind to Mattie's age of twelve, a very one-sided snowball fight would likely ensue (with Mattie receiving whatever icy remnants survived the battle down the back of her dress). Vi would bag the snowball then toss it in the theatre kitchen's freezer because you never know when you need a weird prop like a snowball. Better to have the real thing than a styrafoam one that will make that sproingy-crunching noise when it inevitably hits the floor, sending audience members into thoughts of elementary school science projects when you want them thinking about Fate. The freezer yawned a frosty cloud as I rummaged among the Ziploc bags of leftovers, searching for the snowball my brother saved from January's blizzard. I pried it from the corner where it had bonded to a rock-hard bag of marinara sauce. The ice crystals twinkled under the LED kitchen light. If I bring it to school, would it last until gym class? It would be the perfect revenge for all the times Lisette started rumors about me. Oh, who am I kidding? It will melt for sure before I even get the chance to put the snowball down the back of her shirt, and she’ll turn around to catch me with a handful of slush. Coldness crept along Lani's fingers until it hurt to bend her knuckles. She disregarded the pain. Pain was something she'd lived with her whole life, either in the ring kickboxing, or at home during Dad's bipolar moments. No, it wasn't the pain that confused her today, and she plunged her hands deeper into the snowdrift until a ball of soft ice hardened in her hands. The tighter she squeezed, the more confused she became until nothing else existed but her and the snowball in her hand. Suddenly, a drop of water fell upon her head and traveled down her face, breaking her concentration. "Lani, what the hell are you doing? if you dig any farther the beach is going to swallow you up." Lani blinked up at her brother from her drug-induced haze. She wasn't back home in Boulder, no. She was still stuck in sunny south Florida. Closing her eyes, Lani gave in and let the drug take her mind back home to her gym, her Nate, and her sanity-- if only for another moment. I saw snow for the last time when I accidentally time-traveled into December. Darn faulty machine. I had to crunch through layers of it twice. Once to get to the monastery and the second time to wake Megan from the hibernation. Smushing a snowball in her face did the wakey-wakey job practically instantly. He stretched his ridged neck until the tip of his snout touched the white orb on the forest floor. It was cold! He recoiled in surprise, hot smoke erupting from his nostrils like mist before a storm. When it dissipated, the orb was gone, replaced by a puddle of water. It was always winter on the highway of the dead, but traveling through the lands of ice and snow was beyond miserable. Maeglyn stooped down to pick up a handful of snow and crushed it together into a small snowball. Her spirit guide looked around in surprise at her lagging behind. He was more surprised when she hit him with the snowball. Elin had never seen snow before. Tales from the elders spoke of its wondrous mysteries, but they did nothing to justify the beauty -- and the cold -- of the glittering crystals chilling her hands. Desmond had placed a ball in her hand, tightly formed with the indents of his finger prints pressed into an elegant, though random, pattern. She was memorized. Until something cold pelted the back of her exposed hair. Yelping, she twirled, thick winter coat kicking up powder in the process. Landon stood behind her, smirking, a similar ball in his hand, while Kona, rolled on the ground, grunting dragon laughter spouting from her mouth. After the harsh western deserts, the cold must have been a relief to her scales. “Never played with snow before?” Landon teased. “Great.” He chucked the other ball at her. A squeak left her mouth. She held out a hand, warmth spreading through her body, tingly her fingertips. Just as the ball reached her, it melted in thin air. Her own ball was left on the ground, destroyed from impact. Astrid couldn't feel her fingers anymore. The tightly packed ball of snow had turned her skin red and numb, but she couldn't make herself put it down. Snow. She’d heard of it, but never seen it, never felt it. It was like when she’d seen the Shay River for the first time in six years, surrounded by banks of green. After living in Quavarna for so long, she’d forgotten what a world not covered by orange dust could look like. “You’re hand is going to freeze,” Torren said. She startled, her fingers closing around the snowball as she reflexively made a fist. Glowering, she shook the snow off her hands and wiped the rest on Torren’s shirtsleeve. Astrid promptly kicked a wave of it at his shins. He yelped, floundering to get away, but all he managed to do was trip and send himself sprawling into the snow. If Luma Grey found she was suddenly in possession of a snowball, first off, she’d sniff it. Check for any hints of yellow. Then, if it passed inspection, she’d eat it. Especially outside Elyria Castle. Plenty of streams and lochs can be found in Unseelie, but after those monkey-headed eels attacked her and Prince Simon while crossing a creek in the Veil, she’s been a bit iffy about foreign water bodies. If Hannah found a snowball, she'd throw it at Ryan. She might be a soccer player, but she still has a pretty good arm. But Ryan's not an easy target. Even though he's a swimmer, he can run pretty fast, and he'd probably dodge it. But Hannah can’t run after Ryan. Even though she would like nothing more than to chase him, and wipe that sly grin off his face by hitting him square in the jaw with a freezing cold snowball, she can’t. Because Hannah’s still recovering from her torn ACL and she can't run. But that doesn’t mean she's going to give up. Not yet. So she'll lie and wait until Ryan lets down his guard. Hannah’s not the most patient person, but lately she hasn’t had a choice. Her recovery is taking longer than she anticipated. At this point, she’s not even sure if she’ll be able to play soccer her senior year of high school. But she’s not going to let that distract her from the task at hand: getting Ryan. So she’ll sit and wait for him to think that the game is over, and when he least expects it...BAM! Morelle would stare at the snowball, letting it melt for a while, ignoring the way the cold bites her skin, as she debated whether or not she should throw it, or just watch it undo itself. Sometimes she feels like that; slowly melting towards an inevitable end--but then a friend would call her name and snap her out of it, and without a second thought, she'd throw it at them. They'd laugh and before long, all-out snowball warfare would errupt, and once things heated up--or is it cooled down?--Morelle would waste no time turning to her telekinesis to help amass a snowball horde and matching fortress. She might take the fight a bit too far, and be embarrassed and apologetic afterwards, but her opponent would just be glad they're fighting on the same side. Though snow does make getting around the community on bicycles difficult, Jaden still enjoys the beauty and tranquility of it. She also loves to have fun as much as anyone and if her best friend, Cam provoked her by calling her 'Green Bean' (the nickname she detests), she'd likely fling a snowball right at his face. Then, of course, the fight would be on. Jaden wouldn't give up until she had the last good hit. It so rarely snowed on the island that it felt like a miracle. As her brother helped her off the boat Isla slipped, her legs still shaky from the crossing. Stewart grabbed her arm to steady her. She stretched her hands out, letting the flakes drop onto them. Stewart kept her arm till they left the harbor to stop any chance of an unexpected dip. His Land Rover was parked outside the pub, covered in snow. She knew that it wasn’t the time. The Captain was dying. Inside she was breaking. But there was something about the pure white blanket- it stilled the air, all sounds muted and it lightened her soul. She drew her hands over the hood and packed the powder together. Stewart looked up from de-icing the lock and she threw it square in his face. A look passed over him that asked how she could even think of doing that at a time like this but instinct took over and with a grin he reached up to the roof, formed his own and sent it across to her. The flung a few back and forth until her brother called out. Selene would stare at the piece of white fluff and wonder; how on Earth does this snowball exist? In a world turned to desert, the cool feel would be refreshing. Even though she would be extremely confused by the snowball melting between her fingers, it would only take her a moment to throw it. With her sniper accuracy, she'd hit her boss, Rikkard, right in the face. Once she was done laughing at his bewildered look, only then would she potentially regret it. Matewa woke with me with an excited glint in his eye and the word "sodowa." It was the Tokaroan word I'd dreaded since I'd first heard it, and even more after the lush, green leaves had browned and drifted from the massive trees. A part of me wanted to bury myself in my warm bed. But this was my first snow, so I stumbled to the window. Gio, the wind god, tossed millions of downy, white feathers into the air. In seconds, I was dressed, and Matewa trailed me down the stairs and out of the royal manor. The air wasn't any colder than it had been yesterday. If anything, the blanket of fluff tempered the cold, just as it muffled the sound. Matewa scooped up a handful of snow, and I did too. My fingers froze, but I brought it to my nose, sniffed it--nothing. Then I closed my eyes and held it to my forehead. Matewa's voice was tender: "Watcher of Water?" I nodded as my forehead burned. Never had I experienced the Tokaroan Watcher of Water like this. But it was good. David wrestled his feet as far up his thighs as he could, sitting in more of a basic cross leg position than the contorted posture his uncle sat in when meditating. David closed his eyes and held his hands together, inhaling slow and steady, trying to block out the nightmare that tore him from his sheets. Little pricks stabbed from his uncomfortable legs to his arms. He kept his back as straight as possible, ignoring the shooting pain stemming throughout his body. A nightly breeze seeped through the frosty window, awakening David’s senses, and the hair on his neck. David squeezed his eyes together, blocking out the rasping from the door and thuds beating against the house, fighting the uncertainty of being awake or still trapped in a dream that would never end. His hands went numb, but he could feel something soft inside them. He winced from the brightness of white sparkling around him, blinking until the cloud-like ball in his hands came into focus. He held it before him, gazing at its magnificence. Wondering where it came from. He couldn’t pry his eyes from it as water dripped down his arm, revealing a message hidden at its center. Run! Outside the castle walls the sounds from the courtyard faded. Flakes blurred the world around Synne, and she listened hard, imagining she heard each one falling into place. At the edge of her vision the hedge, wild, thorny, and scarlet, sat still in the silent world. She packed the snowball until it was harder than her fist, a sphere of ice in her mustard-colored mittens. Then she labored through the drifts until she stood, watching the hedge from a safe distance. Not a single snowflake rested on it. She cocked her arm and threw the snowball as hard as she could. Lazily, a red tendril flicked out from the hedge and exploded the snowball into a particle cloud that hung in the air for a moment, the only evidence that the hedge wasn’t asleep. Kylie would take a nice round snowball and pack it with hard ice. Then she would place it on a boomerang slingshot and aim it for Micah. He ruined her life and tried to sabotage her career by joining evil forces with a mad man. She would take all of her vented out frustration on it and would hit the bullseye to peg him down. Kris held the snowball, feeling the icy burn as it sat in her hand. It wasn’t a perfect sphere, but it was close enough. It’s a shape with no holes, different from a donut, she thought. I memorized the formula for its volume and surface area when I was five. Now at 16 I know the proof of the Poincaré conjecture about all the possible shapes in three-dimensions, and how they all boil down to this innocent-looking ball. The wind caught Kris’s blond hair, which she let down on this cold January day in Toronto. It broke her mathematical reverie, and her cheeks felt hot against the freezing breeze. Sonu touched her arm and her spine tingled. Kris let go of the snowball, and it fell to the ground, merging with the vast ocean of white powder in the park framed by rows of skeletal looking trees. Snowflakes fell around them, each one unique in their near infinite complexity. Kris grabbed Sonu’s hand, and she tried not to think about the alien orbs that shook the world to its core months ago. The orbs were spheres too, but black and terrifying. Now they were gone, like the snowball broken on the ground. What remained was only the memory of the friend she lost forever. Aramay stood on the edge of the Battersall Bridge snowball in hand. The bridge was icy;she'd slipped twice stepping down to the observation rail. The last time she'd been here the air held the scent of summer. Now a raw wind stung her gloveless fingers. She could drop the snowball and rid herself of the painful coldness. But, if she did, it would fall toward the frigid water below turning to nothing in front of her eyes. She felt his presence behind her. She had known he would come. She'd packed the snowball hard, knowing what she migiht have to do. She moved one step closer. So did he. She heard him slip and curse under his breath. Now was the time to make her move. The shadow collected itself in a dark column that disappeared into the depths of the cliffs. Was this a chimney for the ruined monastery? If it was, she and Horace could jump down and cross the cliffs in silence. If they didn’t become trapped in there. Pavan peered into the darkness and threw the snowball. Somewhere in the darkness far below, it landed with a muffled thud. Given the demons she finds herself facing lately, Gwen would take that snowball and have it blessed. Then she would use it as a weapon against at least one of those creatures. Snow is Maine's downside. I could be in SoCal, the Bahamas, Rio. I had a perfectly good time with a chick in Tahiti one winter a few decades back. She was probably a grandmother now. The snow exploded in a puff at my feet. Artemis, my twin, goddess of the hunt. Somehow she'd tracked me down in this godforsaken place. I picked the projectile up. The snowball was packed hard, and encrusted with ice. She'd been licking it, increasing its odds of flying true and hitting hard. I waited for her head to peek out from behind the tree, and launched it. They don't call me the Archer for nothing. My sister might be able to track her quarry over tundra and terrain. But I was the one who'd bring it down at the end. Emily would make the biggest snowball she could find, and then stuff it in her stupid roommate's stupid face. Take that, Denise! Living in NYC, snow is a regular occurrence for Liam. If he was given a snowball, he would probably look at it for a second before letting it drop to the ground. You see, snowball fights were a favorite of his sister. And he's spent the last four years searching for her. Space-ninjas who grow up on jungle worlds don't see snow that often. The first time Lem saw snow, she'd just fallen thirty feet from an exploding spacecraft. Powdery white splashed up around her impact: "Jei, holy shyte man, you okay?" sputtered through her lips as she sank and tried to swim and found herself flailing. She righted herself somehow--drew her neodymium mace--yelled for her partner again as she swung to smash and slice the material around her, only to watch it melt and pack instead of breaking. "Welcome to Alpino," I laughed behind her. I'd normally gripe at her, somehow make the ship explosion out to be her fault, but the way she totally ignored the new experience of snow made me smile. She whirled and looked up at where I stood above her, on a harder snow-bank. "Shyte man, what is this place?" "Dunno. I've never been here. I don't own the whole planet." Lem scowled and threw something at me. And that was when the burning ship crashed next to us. North's never seen snow, much less a snowball. It's 2041. Temperatures have changed. Gaia would DRINK the snowball (and share it with Neev and Armin, of course). Having quenched their thirst, they can now continue on the journey as planned, with the three wands they have, and... I just lost my best plot twist. James would use a snowball as a weapon or as a source of water. When you're on the run from black market organ profiteers, a snowball has value--everything has value. It just depends what he needs it for most. Maya grasped the snowball between her hands, its cold spreading into her palms and tingling her fingers until they were pink and raw. She squeezed harder still, embedding her hopes and dreams into the ice until they were nothing but dewdrops on the pavement. Emilia would stop the snowball fight by making gourmet snow cones for everyone. My MC would team up with her brother and heaven help anyone who got in the way of their snowballs. Seriously? Snow? In July? In the Hamptons? It’s my engagement party and I will not die again! The Light Coven witches put a bit of a damper on this party, but it was the only way to prevent Mohana, the succubus witch’s wrath. You know what they say about a woman scorned, but Drew and I were destined to be together – for over a century. Just when I was thinking that I could soul-gift to this Dark Coven witch, that I could convert her, that there had to be some good left in her… Although Mohana’s strength was in maneuvering the elements, the Light Coven took her by surprise with this nor’easter snowstorm. Mohana’s rantings and ravings slowed, as her face and extremities began to freeze. She was hovering in the night sky when this battle began, but now she was wavering as the cold winds swirled only around her. I made a snowball, scraping some ice and packing it into it and hit her in the head. She came down with a thud! I jumped for joy, and slipped. Oh no, did I crack my skull? This is not a good day to die – again! I'd melt it in a heartbeat. I'm out of water. My bottle is dry and I'm about to collapse. My friends don't have any either. Melting it wouldn't take long in this heat. If it were small enough, I'd pop it in my mouth and let it slowly melt away on my tongue, savoring every last, icy drop like an ice pop on a hot summer day. But I couldn't have it all to myself. I'd hate myself if I did that. So I'd stick it in a cup and wait for it to melt, then give the cup to the sick boy first, followed by the others. But finding a snowball in this place will never happen. It would take a miracle. Or magic. And I don't have either. Galatrin had seen snow her entire life in the mountain fortress of Isenford. She remembered playing in it as a young child but she'd never held a snowball in her hands until now. Princesses aren't supposed to take part in snowball fights but Galatrin found it difficult to resist lobbing the cold, smooth ball in Kiro's direction. She hit him square in the chest and feigned injury, all the while laughing. The journey almost killed his friend and only ally, but Fortwall has at last found a snowball. Combined with the ober from the mines, it can render any of the enforcers useless. They wouldn’t have time to stop him on his way to the surface, to freedom. The snowball would save him, and countless others, from the unbreakable darkness that means to keep them prisoner forever. Jimmy took the small, round orb and tossed it up in the air once, twice, three times, wishing someone he hated would stroll past. There were so many people he would love to smack in the face with this thing. Finally, a lanky form drew close, jogging around the bend. It was Lacy. He let the snowball drop from his limp fingers. Snow had many different scents – the ozone of an impending storm, a crisp ammonia-tainted sheet from a windshield, or plastic ice deposits inside a freezer. The fully-formed snowball that’d appeared in Garrett’s hands was rolled with the smell of grass and earth. “Got you!” Garrett had come the opposite way instead. He’d wrapped his arms around her and picked her up. He felt her laughing, pushing away to free herself, but he kept her close and inhaled deeply. The smell of winter mixed with the salon scented cloud of May rose gardens and orange cream that was his beautiful little girl’s hair. The snowball in Garrett’s hands was another seemingly tiny thing. A flash from a future he’d never have. He dropped the snowball and crushed it back into dirt where it belonged. Tanvi would stack snowballs into snow people, with carrot noses and button eyes. That is, if she had been six, not sixteen, and if the nightmares had never happened.